December 2010 – CREATE. PLAY. TRANSFORM. Organic food and other organic products have found their way in the homes of people in The Philippines for years now. There are several farms around the country that offer a variety of organic vegetables and livestock. Whether in Luzon, Visayas or Mindanao – people are becoming more aware of buying and consuming fresh, and chemical/pesticide-free food. I’m really looking for a place where I could sell my handmade pots. 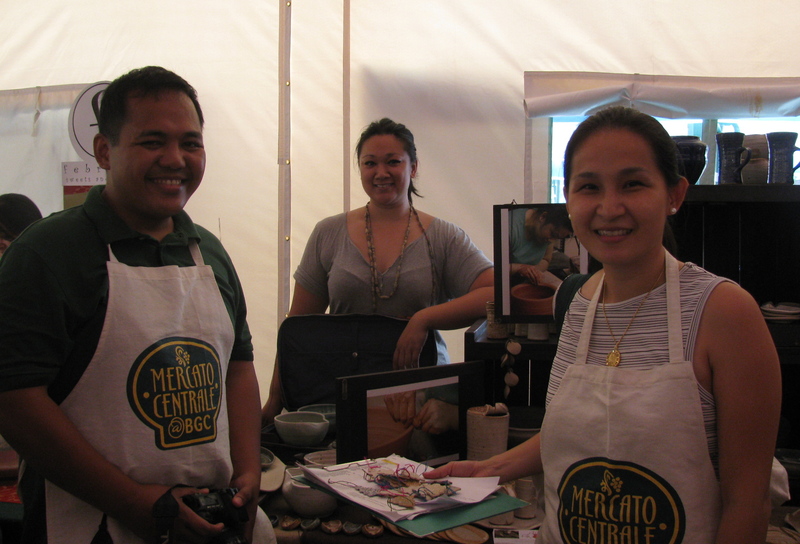 I joined Mercato Centrale for the very first time today. Woke up at 4:00 am to make it to the cut off Ingress time, which is at 6:00 am. I got there at 5:30 am and just enjoyed the cool tent. I was yawning from the moment I woke up, until I saw my table at the venue. People were starting to come as soon as the sun started rising. It was good seeing early risers and runners in their running outfits, who want some good breakfast after their morning run. Shorts, sweaty hair and legs, organic vegetables, breakfast, sunrise, saturday and sunday. I am certainly loving it already. I am not only encouraged to eat healthy food, but also encouraged to look fit again one day. Selling handmade ceramics is not easy. But there are people who really collect handmade ceramics that were created with sweat, laughter, and tears. Most Philippine potters sell their works in Art galleries, others produce hundreds of pieces for restaurants, resorts, and hotels. I produce my one of a kind works to those who love food and want a unique set of dinnerware for their homes. I don’t usually repeat my designs. But if I find a certain design as a crowd favorite, by all means, I will reproduce the same line. I am looking forward to produce more organic ceramics. Inspired by nature. Functional pieces. Slightly different from one another, but it can be part of a whole set: plates, salad plates, soup bowls, salad bowls, mugs, cups, spoon & chopsticks rest, and everything else that these hands could make. 100% Passion for handmade ceramics. 100% PINOY. 100% Mia Casal. I am thankful to be at Mercato Centrale, where lifestyle, good food, and happy people, come to spend easy mornings on weekends. Anton Diaz has amazing plans for 2011 to look out for. I will post them here, as soon as he officially announce the news to his blog readers.